Exclusivity, thematic ambience, and elegance is nestled at the very spot where the Pacific meets the Sea of Cortez, right next to the illustrious rock formation known as Land’s End. This Luxury Cabo Hotel is reached via the only privately owned tunnel in Mexico–Dos Mares. Carved through the heart of the mountain, you venture through a dramatic entrance to the resort that separates the town of Cabo from the Pacific Ocean. Even more enchanting, the resort has El Farallon, a seaside grill that is one with the mountains. At this cliffside dining area, you’ll enjoy the sunset like royalty. The Resort At Pedrigal is all about “wows” and exceeding expectations. This fabulous resort has the best of both world as it provides a tranquil environment, but you can always find relaxing fun down by the pools and bars. You are also a 3 min drive to downtown Cabo for local experiences. 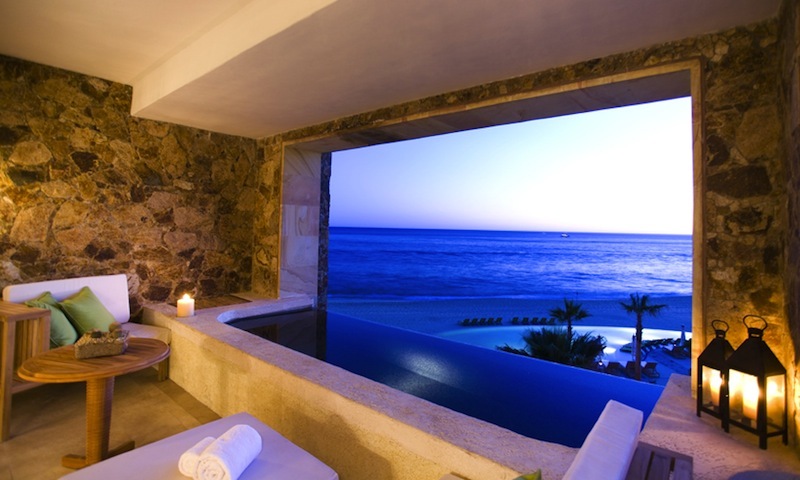 The Resort At Pedregal is all about class and more class. What you are about to experience is top-notch restaurants, chefs and bars with mixology bartenders. You are about to dine next to amazing cliffs that overlook the Sea of Cortez and the sunset. You are on vacation so casual fine dining is the readily available, but if you are really looking to Suite Up or put on those heels you can always discover and enjoy the restaurant El Farallon. Provecho! You have access to a gorgeous beach with amazing sunsets, but please understand that The Resort At Pedregal’s beach is not recommended for swimming, as there are many rocks and strong waves. This factor should not detract from your enjoyment, as there is an assortment of fabulous infinity-edge pools overlooking the Pacific Ocean, and plenty of water activities. 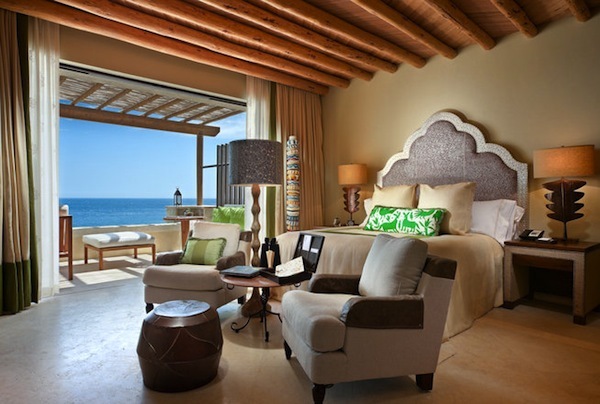 Our Ocean View Rooms offer beautifully appointed custom made rooms with handcrafted Mexican details throughout, providing an authentic Cabo San Lucas retreat. 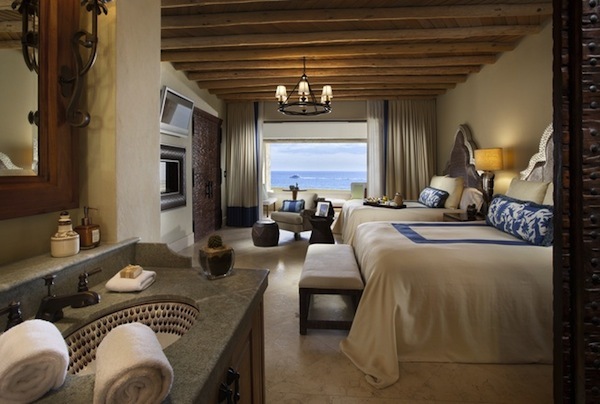 Our Ocean View Deluxe Rooms offer beautifully appointed custom made rooms with handcrafted Mexican details throughout, providing an authentic Cabo San Lucas retreat. Be greeted by premium bedding that encourages a peaceful night’s slumber, handcrafted Mexican motifs, a relaxing rainforest shower, private terrace with picturesque views to experience an unforgettable seaside retreat. 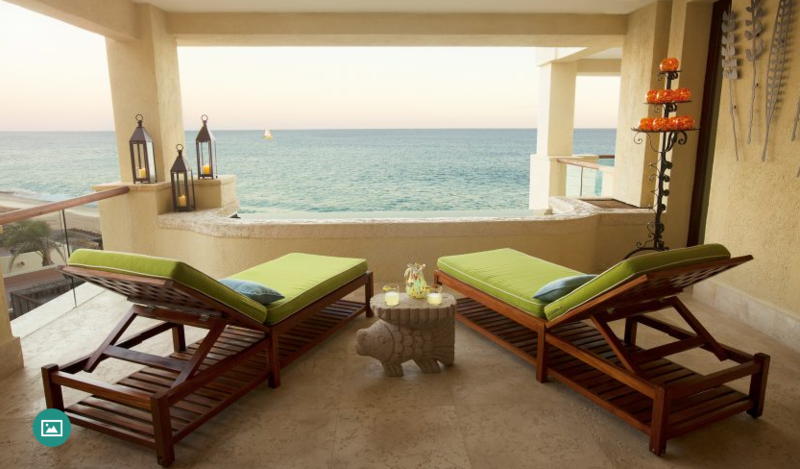 Each of our stunning ocean view Los Cabos accommodations are reminiscent of indulgent touches you’d expect of a private oasis that dreams are made of. Characterized by an unparalleled dedication to service, our team is happy to offer the most sophisticated Cabo San Lucas rooms with ocean views around. The Two Bedroom Ocean View Suite is laid out as a one level accommodation entering through a hallway into an open plan sitting, living and dining area, leading on to a large entertainment terrace with private plunge pool with chaise lounges overlooking the ocean surrounding Cabo San Lucas. 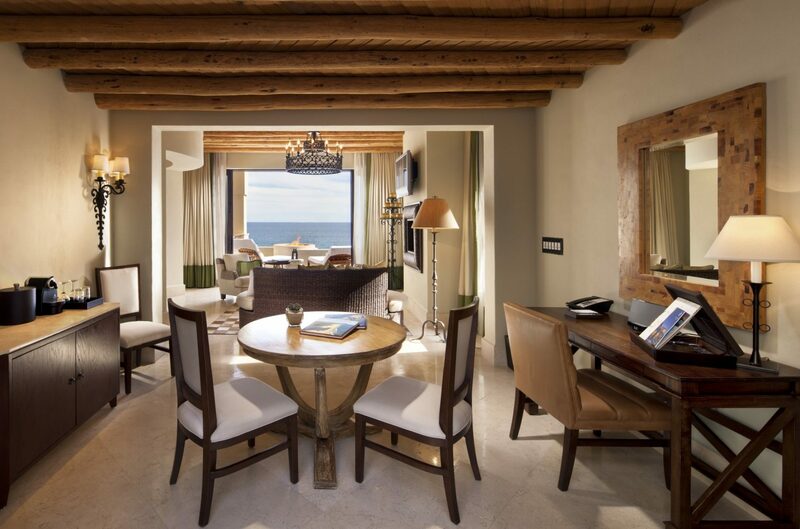 Be greeted by one of the most luxurious Los Cabos hotel suites in the area spanning over 3,800 square feet and offering indulgent perks that you’re unlikely to discover elsewhere. Experience the best that The Resort at Pedregal has to offer by immersing yourself into a truly luxurious stay in our four bedroom casita. 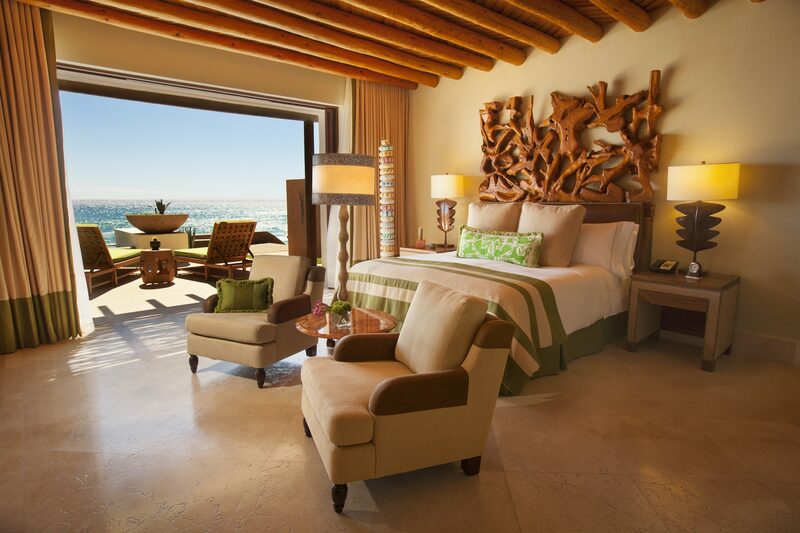 From four expansive bedrooms that have been designed with state-of-the-art touches designed for your comfort and convenience to modern perks that make every stay a pampering adventure, our hotel suites in Los Cabos are an exquisite representation of the finest accommodations The Resort at Pedregal has to offer. Pamper yourself to a vacation in our four bedroom casita which accommodates up to eight to discover iconic pieces from local artisans, a grand master suite, spacious bathrooms with rainforest showers as well as a private plunge pool on the terraces which offer sweeping views of the Pacific Ocean. Consistently rated among the top Cabo luxury beach hotels and resorts. Offers luxurious accommodations, distinctive cuisine, and the finest amenities. It cuts a striking profile on the white sand beaches of Cabo San Lucas, with spectacular views of Cabo’s famed rugged arch, Los Arcos.